MyMemories Blog: Today's Daily Designer....vornehmLaden Digiscraps!!! So, I'm Rebekah. 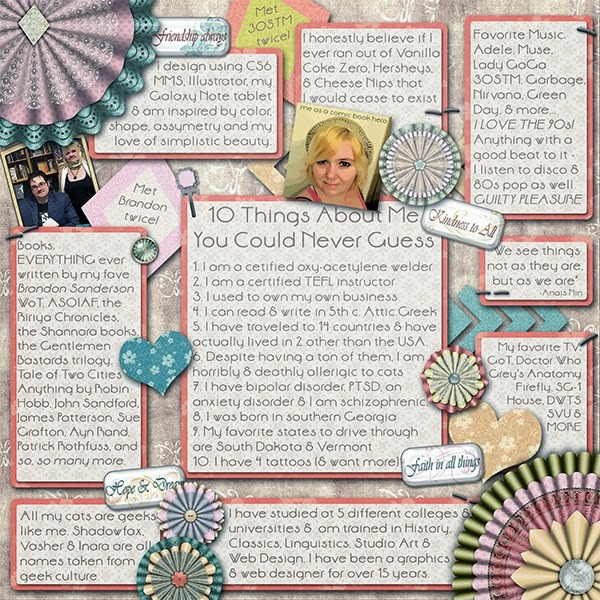 You can probably tell from my layout that I'm a HUGE geek... but that layout doesn't even begin to cover it! I'm that girl who plays video games, board games, RPGs, LARP, MMOs, goes to conventions (so far at conventions I've met Michael Shanks, Morena Baccarin, Sean Maher, Joe Flanigan, & Christopher Heyerdahl), can fix a computer with her eyes closed, etc. etc. You name it! My favorite tattoo is the Point of Origin: Earth symbol from Stargate SG-1, and I have plans for another SG-1 tattoo as well as a design for a tat written in Circular Gallifreyan, a language from Doctor Who. I love cats (even though I'm terribly allergic - thank goodness for Flonase! ), and I name them all from geek culture references. Shadowfax is my silver girl, and I call her "My Precious". She was named from LOTR. Vasher is my black long-haired kitty (even though his nickname is Puppy) and he's so loveable (when he wants to be!). He was named after a character in Brandon Sanderson's book Warbreaker (which everyone should really read because it's fantastic!). Inara is a sleek black cat, and her name is from the TV show Firefly. The funniest part of all their names - they totally take after the characters they were named after! haha! I've had a smattering of kittens here lately, as we waited for the voucher to get Vasher snipped... and some of the kitten names were Arry (from Game of Thrones) and River, Rory & Amy Pond (from Doctor Who). They also took after their names. I just love how cats can do that, embody their names in full! I also love music!!! I love going to concerts and being front and center jumping up and down and screaming hahaha! I've met the band members of 30 Seconds to Mars a few times, and was even on stage with them at a concert in Baltimore. It was unreal! I would love to see Adele, Lady Gaga, Pink and Maroon 5 live as well, but haven't yet. My roughest concert was seeing Muse at Key Arena in Seattle. I ended up with a cracked rib, popped blood vessels in my arm and somehow survived a mosh pit that I was thrown into, but it was SO much fun! Thanks for taking the time to read about me a bit, and I hope to see you around the MyMemories forums!